This past July, around the 73rd anniversary of the outbreak of the Civil War and 11 days after the opening of a large Robert Capa exhibit at the Catalan National Museum of Art, the Barcelona news paper El Periódico de Catalunya published what was billed as a stunning revelation: Capa’s legendary photograph of The Falling Soldier was a fake. New evidence, the paper claimed, proved beyond the shadow of a doubt that the image was not taken at Cerro Muriano near Córdoba, as had long been assumed, but some 50 kilometers south, near the town of Espejo, which Capa and Gerda Taro had visited previously. This meant that the militiaman depicted was definitively not Federico Borrell García, an anarchist known to have been killed at Cerro Muriano. 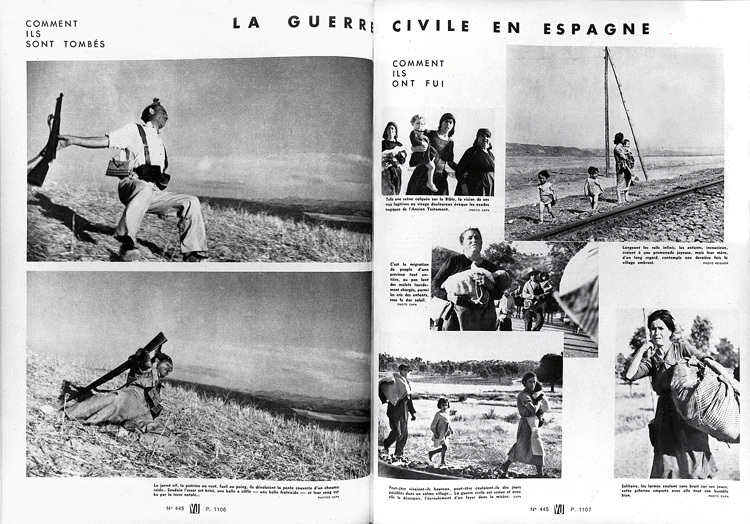 In fact, because there is no record of any battle action in Espejo when Capa was there, the paper concluded that the photo must have been staged. In the following weeks, pundits and columnists in Spain and else where pondered this revelation. Was Capa a fraud? Should his whole work be re-examined? Did he intend to deceive the public or did the editors of Vu and Life, who first published the image and wrote the initial captions—with Life claiming Capa had captured “the moment of death”? An editorial in El Periódico forgivingly called Capa’s trespass un pecado de juventud, or sin of youth (Capa was 22 at the time). Others went further. The president of Journalists without Borders ques­tioned Capa’s professional integrity. Some accused him of cheating for the sake of money and fame. But the photographer had defenders, too, some of whom, even while admitting the new evidence of the photo’s location, still refused to accept that the image was necessarily false. As others, including Capa’s biographer Richard Whelan, had done before, they maintained that the soldier may have posed for the camera, only to be unexpectedly hit by a live bullet, perhaps from a sniper. As the controversy spread, it was hard to avoid the impression that there was something fishy about the affair. While El Periódico’s coverage was picked up in the international press—in the English-language media, it was featured by the BBC, Time, and the New York Times—it was ignored by El País, Spain’s largest national paper and leading online news portal for the Spanish-speaking world. Moreover, most of El Periódico’s revelations were not really new. The data on the new location were largely based on a book by José Manuel Susperregui Etxebeste, a Professor of Audiovisual Communications at the University of Basque Country. This book, Sombras de la fotografía. Los enigmas desvelados de Nicolasa Ugartemendia, Muerte de un miliciano, La aldea española y El Lute, had come out months earlier and had been covered by Giles Tremlett in The Guardian (June 14), as well as by El País (July 6 and 7). Some years before, moreover, two documentaries— Los héroes nunca mueren (2004) by Jan Arnold and La sombra del Iceberg (2007) by Hugo Doménech and Raúl Riebenbahuer—had revealed that the soldier could not have been Borrell. To be sure, El Periódico claimed to have found additional evidence confirming Susperregui’s findings and to have located the exact place the photo was taken by analyzing the shape of the mountain range in the background of one of Capa’s photos taken the same day. But the landscape case had been made a month before by a photography blogger, José Manuel Serrano Esparza. The timing of the scoop was a bit suspicious. Was El Periódico trying to milk the anniversary of the war’s outbreak and take advantage of the opportunity in a slow summer month? The question is not so much where Capa’s photo was actually taken or if it’s “real” (whatever that may mean), but why so many people continue to feel so strongly about it. Different explanations suggest themselves. The debates about the “recovery of historical memory” have made clear that the war still matters to present-day Spaniards. There is a widespread sense that unpleasant truths remain to be revealed or, similarly, that some long-held certainties will be exposed for the lies they really are. Andalucía is currently in uproar over the grave of the poet Federico García Lorca: It is clear that there are several bodies at Víznar, near Granada, which Lorca’s biographer Ian Gibson long ago signaled as the poet’s burying place. But conspiracy theories abound. Is one of those bodies really Lorca’s? Was he secretly disinterred? The Lorca family initially objected to exhumation. Gibson insists that the issue tran scends family considerations: All of Spain deserves to know whether the remains are Lorca’s or not. The Lorca case also raises questions at the heart of the Capa controversy. Who owns the story of the Civil War, for example, and who can make claims to the his torical truth? But this is not the only issue. The recuperación de la memoria histórica, spearheaded in 2000 by Emilio Silva when he founded the association of the same name, continues to be con­troversial. It has exposed or fueled tensions not just between Left and Right and between the Spanish central government and the autonomous regions, but also between established academic historians and non-academics who claim to tell stories about the past that are true and relevant—including aging victims of repression and their family members, citizen activists, journalists and documentary makers, or amateur scholars. Those same tensions are at play in the debate around Capa’s Falling Soldier, in which key contributions have been made not just by curators and scholars with access to the full archive, but also by journalists, amateur historians, and bloggers armed with little more than a ticket to an exhibit, a digital camera, and time to scout out locations. But now there is mutual distrust and suspicion; rather than a collective effort to get to the truth, the debate has become what the Spaniards call a diálogo de sordos, or deaf man’s dialogue. The book that located The Falling Soldier in Espejo is not just about Capa. It aims to reveal the truth behind four photographic images, or sets of images, that have achieved iconic status. 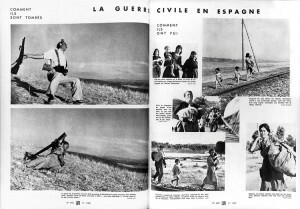 Besides Capa’s print, it has sections on a much-circulated shot of a forlorn family of Basque refugees (who happen to be the author’s aunt, cousin, and great-grandmother), Eugene W. Smith’s reportage of a Spanish village (published by Life in 1951), and photos registering the capture of the infamous criminal “El Lute.” The author, J.M. Susperregui, is driven by a philosophically naïve but useful principle: press photography, he maintains, is either true or false. It either registers actual events as they occurred in reality or it seeks to manipulate that reality, thus deceiving the audience. The only way to find out which is which is by carefully looking at the image while, at the same time, reconstructing the exact circumstances of its creation. This is precisely what he did for the Capa photo, beginning with a detailed review of all the evidence and arguments presented so far, and then moving to his own analysis and conclusions. Although Susperregui’s style is more essayistic than academic—he tends to be colloquial, chatty and a bit prolix, and the book is not edited very thoroughly—he presents his case with a good dose of common sense. His final position is clear: the militiaman depicted is not Federico Borrell; the picture was not taken at Cerro Muriano, but at Espejo, and before September 5; it was not taken with Capa’s Leica, but with Taro’s Rolleiflex, and likely from a tripod; it was posed; and the soldier is only pretending to have been hit. Regardless of whether Susperregui is right, he brings up a number of issues that have been glossed over by previous scholars—some surprisingly so, because they are photo-technical in nature. Susperregui notes, for instance, that the image in Life in July 1937 contains a much larger portion of sky than the first published version in Vu of late September 1936. The changed aspect ratio suggests that the photo may have been taken with Gerda Taro’s Rolleiflex (which produces square negatives) rather than with Capa’s Leica (whose negatives have a 3:2 ratio). This is not a crazy supposition: We know Capa and Taro were both there, and of the 40 prints that have been preserved, at least eight were taken with the Rolleiflex. Given that this was a heavier camera, however, it is likelier that Capa would have used both hands to take the picture, or perhaps even a tripod, belying his later claim to have shot it by lifting his arm above a trench and without looking through the view finder. The fact that both photos published in Vu are of two different soldiers dying in exactly the same spot, and that both images are almost identically framed—as is a third photo from the series depicting a running militiaman—further supports the tripod hypothesis. How likely is it that two different men were killed on the same precise square meter in the rearguard, within moments of each other, with a photographer there to capture both deaths with an amazingly steady hand? For those who have doubted the authenticity of The Falling Soldier, the status of Capa’s photograph is directly linked to the photographer’s integrity: If the picture was a fraud, then so was he. The biggest tactical mistake of Capa’s biographer, Robert Whelan, was to accept this premise, in effect allowing Capa’s reputation to rest on this one question. In 2002, when all evidence seemed to point in the direction of Borrell, Whelan concluded in an article in Aperture: “May the slanderous controversy that has plagued Robert Capa’s reputation for more than twenty-five years now, at last come to an end with a verdict decisively in favor of Capa’s integrity. It is time to let both Capa and Borrell rest in peace, and to acclaim The Falling Soldier once again as an unquestioned masterpiece of photojournalism and as perhaps the greatest war photograph ever made.” Implicit here is the admission that reopening of the case will automatically draw Capa’s integrity into question once again. A whole photographic career, however, does not stand or fall by a single image. More important, Susperregui’s driving principle, that a documentary photograph is either true or false, does not hold up in practice. Documentary evidence is more complicated. The working conditions for journalists in Spain were extremely difficult, as Paul Preston has made clear in We Saw Spain Die. The majority of what we consider documentary material of the Spanish Civil War was doctored or manipulated in some way, if not by the writers and photographers, then by the Spanish censors or the editors at home. And even if objectivity or neutrality had been possible in the coverage of the war, few people thought it desirable. The political stakes were high—and so were the publishers’ and the public’s demand for sensational images of suffering and death. It’s time to ask the central question: What if The Falling Soldier were staged? Would the knowledge that the man depicted in this image did not die at the moment the photo was taken change the way we think about Spain, the Civil War, or twentieth-century history? The answer is that it wouldn’t. Capa did not record a news event at Espejo. What made his image so powerful was not that it pictured a history-changing, unique incident—the moon landing or the murder of a president or the conquest of Teruel. We see an unknown man dying at an unknown location in Spain, and we know, as did Capa’s first viewers, that hundreds of Spanish men and women were dying in this way every day. Limiting the discussion to the true-or-false question does “not initiate the most useful lines of examination,” to borrow Geoff Pingree’s words. We should remember that Capa’s work was as much about illusion as about reality. His job as a photographer was to allow the readers of Life, Vu, and Picture Post to feel as if they were on the battlefront without leaving the safety and comfort of their homes. This illusion—made possible by new technologies as much as by the photographers’ courage—was half of the excitement. It is no coincidence that in December 1938, Picture Post printed a full-page portrait of Capa, author of “the finest pictures of front-line action ever taken,” while Life claimed that its camera (that is, Capa’s) “gets closer to the Spanish war than any camera has ever got before.” In the end, the magazines’ infatuation with their sensational reporting is not unlike El Periódico’s fascination with its coverage of the Capa affair this past summer. Capa’s photos mobilized the illusion of proximity, and his own reputation, to tell truths about the world, in much the same way that good realist fiction does. That this man may not have been dying or dead when Capa pressed the shutter release does not mean that this dramatic image does not accurately represent the deaths of thousands like him. Fiction and non-fiction are not synonyms for falsity and truth. An undoctored photograph can be a lie, in the same way that a doctored one may well reveal the world as it really is. The fact that Capa’s Falling Soldier—by all accounts a realist, representative image of the Spanish Civil War—almost imme diately acquired the status of symbol representing the whole struggle of a people (or, alternatively, the horrors of war) made the question of whether the photo was or wasn’t “authentic” even more irrelevant. In this sense, revealing that Capa’s image was staged would be like revealing that there is no actual body in the Tomb of the Unknown Soldier. Susperregui’s book makes a significant contribution to a long-standing debate. When it comes to establishing whether The Falling Soldier was staged or not, Susperregui certainly bolsters the doubters’ case. But if he is right, the only thing lost is our certainty that the photographer happened to be there when one particular death occurred, while we know that hundreds of thousands died, with or without a photographer present. This may lessen our belief in serendipity, but it should not affect much else. Sebastiaan Faber is Chair of Hispanic Studies at Oberlin College. His latest books are Anglo-American Hispanists and the Spanish Civil War (Palgrave, 2008) and Contra el olvido. El exilio español en Estados Unidos (Universidad de Alcalá, 2009). This statement, is it possible to see a source or citation? Sure, it’s José Manuel Susperregui, _Sombras de la fotografía_, Bilbao: Universidad del País Vasco, 2009, p. 69. Two points occur to me. The first is that if the image was cropped from a square negative which originally included more sky, and if it was posed and taken with a camera on a tripod, then why not move the soldier nearer so that he filled more of the negative? Second point is that it is perfectly easy to take a shot with a Rolleiflex while holding it above one’s head. You hold it upside down and and look up at the viewfinder. This technique is shown in early instruction manuals and photo guides on the Rolleiflex. I lack the expert knowledge to pass an opinion on the picture’s veracity but the second point I make must have occurred to anyone who has used a Rolleiflex or Rolleicord.